This week has been spent counting, sorting and packaging. Actually I must admit that most weeks are spent this way but it is Saturday afternoon and the kitchen bench is free of fibre, fabric and other stuff much to Ian's delight. Watched rugby and used the time to package slushies and silk tops - sadly the Hurricanes lost but the first half was terrific and fast. four games today so skipping one because the Force are playing at the park. A few people have asked what team Ian is going for - at this stage - it is the Chiefs so of course he was delighted with their win. I have been up working on Romeo - nearly finsihed all that I am doing but this is for a book cover. Finish it tomorrow. This is stitching knitting ribbon to make a braid. It's so easy on Romeo becasue it is so stable. 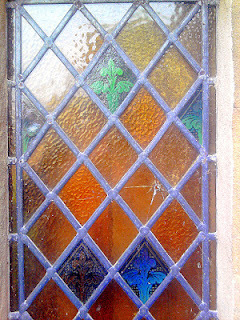 And this I stiole from Shelagh's blog - she said it reminded her of Provence and it does for me too - love the fleur-di-lys on the glass. Absolutely inspiring. 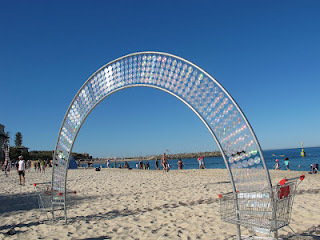 Thanks Shelagh - it is fabulous and i wish it was nearby for me to see. 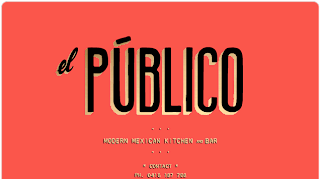 We went to a new restaurant on Wed - El Publico - Mexican in Beaufort Street - it was opening night so we went early before all the crowds rocked up. Great food and wine. Worth a visit. I have written my share of the newsletter so it should be ready tomorrow. I have spent most of the day rolling all the kunin felt rolls - a long job but satisfying to have finished. Just as well I cleared the space outside the front door because a shipment of lovely silk sari ribbon arrived including some I am calling Pretty in Pastel - they will go on the web as one-offs mostly because they are all individuals. 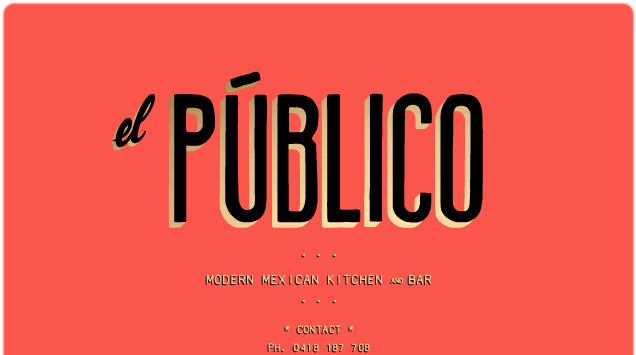 We will have new colour themes coming in the next few weeks which is very exciting stuff. So the day has flown by and nothing creative has happened apart from the satisfaction of ticking everything off on my today's list. Doesn't happen very often. Wondering if anyone else has a lazy postie? We get mail every day but lately we have been getting lots of other people's mail as well. Because we post parcels every day I put them in the bins with the parcels and write on them - 'lazy postie - please deliver to the address on the envelope' Now we can do this easily because Ian has to drive to the central posting every day but for others, I have seen people running around the streets doing the postie's job for him. Worrying times indeed. Monday cometh - what happened to our weekend? After a busy weekend on we go. The back garden looks tidy though. Thanks for all the lovely comments and emails - we thought it was a nice atmosphere and better than a show - while it was extremely busy in the morning (well it is at shows too), people were able to meander and look without having to squeeze into spaces where we usually load hundreds of products - and it was more relaxing for us as well - and I enjoyed the space of being able to demo. So we are thinking we might like to try a Spring Open Day maybe in September. What do you think? By then Harley may be brave enough to nag around - one look this time and she was off - either to the fireplace or under the water tank. And you know we forgot to put out quite a few products but I am not sure there was any more room. One of the things about being at home is that you can go and get something when someone asks instead of having to say "it's not here - it's at home"
I thought I would show my Starburst Spray colour chart - I got it all up on foam board on Friday night and some flowers fell off but it was helpful for people to see the colours. I shall get the Moonshadow Mist one done next. in the meantime today I finally got my velvet project finished and away (bad late girl I know) and packaged silk cocoons and rolled kunin felt - a job which has been waiting for a while. Best excitement as always were the parcels - new Karantha moulding mats - and the Dylusion Inks - yeah - they will be on the web tomorrow. I love inks and sprays in case you didn't know. These are for paper - they are just inks. Very bright colours. We had a lovely day yesterday for our Open Day - the weather was perfect - even clouded over and not humid. Many thanks to all the wonderful customers who came - we were really busy in the morning. Hope you all enjoy your goodies. Kazuko pulled a lucky winner out of my new red shoes box and congratulations to Kerry Svenson who won the $50 voucher to spend at the Thread Studio anytime. I played with the Gelli Plate - surprise surprise - this is on silk - I managed to spray over with Starburst because I could. We have sold out of the big plates again but more are on their way - still got some small ones in stock. And while I was at it I used the Gelli Plate to print onto Romeo - all ready now for stitching onto. Today was supposed to rain but it didn't although it is humid and we have been slow and lazy about putting everything away. But we did stocktake lots of things which makes life so much easier - I have even been reordering on a Sunday. It is a chance for us to tidy things up inside the 'shop' as well. I am back at my embellisher finishing a project and then I am planning to sit outside and read my book. I think I deserve it. The back garden has all its tables set out for tomorrow - come 10am they will be full of new goodies, favourite goodies and super specials. We will be up bright and early. I spent time yesterday and today rolling up our new hand dyed blanket rolls. Jacinta sends everyone out to hunt for woolen blankets and then she dyes them up and sends them over. You should be able to recognise the colour themes. And a pile of them. I don't know - the week is whizzing along and we seem to be flat out - magazines coming in and out and through our ears - or something. 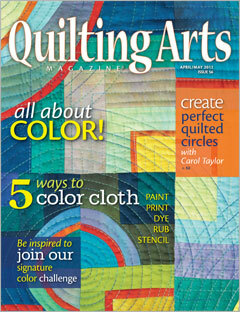 Down under Textiles - Stitch (all gone already) - Quilting Arts - another round of Stampington so we have more Art Journaling once again. Stampington have been wonderful to deal with and I am able to get back issues for people if they still have them. I just need to fill a box with mags. This gorgeous doll was made by Beth Beglin who brought it to show me at the Silk Stuff workshop last Saturday. She used the Venice Limited Edition and it is so gorgeous. Beth also brought us some wonderful goodies from her business - Pepper Tree Grove - this is from the web - I don't think they have a website but if you are going to York do visit - we have been indulging in chocolates - plum jam -olives and olive oil. Thanks so much Beth. Pepper Tree Grove is a boutique family business producing and selling award winning Extra Virgin Olive Oil. We are also York's original producer of a delicious range of handmade chocolates, using only the finest quality Belgian chocolate. Our other products which we make and sell are table olives, Tapenades, Dukkah, Jams and Chutneys. We are situated on 5 acres of land, nestled under Mount Bakewell, with four acres of olives planted in 1998-99. There is also one acre of gardens surrounding our 100 year old + cottage, which is part of the Shire of York's heritage inventory. We bought our lovely property in 2002, which included a badly neglected olive grove. The first 6 years saw us rebuilding the grove into the standard you will see today when you visit. Paragliders and hang gliders are an attraction to our area. If you visit us later in the afternoons on fine sunny days, you maybe lucky enough to see these brave enthusiasts flying over Mount Bakewell. You are very welcome to wander through our grove and sample our wares. Taste test our delicious products on Saturdays, Sundays and Public Holidays between 10am and 5pm, or by appointment weekdays. We are only 2.5km (4 mins drive) from York Information Services and have plenty of signage on the main roads to guide you. I am preparing for our Open Day - it will be like us at the Perth show - I have been rolling up the lovely hand dyed Evolon - Jacinta is feeding them to me slowly. 50cm x 50cm approx for $6. Here is the latest QA - it will go out tomorrow. Now back to embellishing velvet and flimsies and sewing on more beads. I have been beading the Romeo piece - long slow process - think that is why I don't always bead. I am the person who spills them all - yes I have the felt tray which Val Campbell-Harding told me to make but then I forget to put the beads on it. So that is why I went off to experiment with yummy velvet and flimsie and I have to say I am very pleased with the first effort. Watch this space, for there will be more. Here is Harley being a potted cat - her latest trick is to sit in the pots - I think she is hoping the birds don't see her and she might get lucky but our birds have all been around longer than her. When she is not in the pots she is in charge of all the doors. Last night she jumped in the bird bath - fortunately for her - no water in it. I had a lovely workshop today - hope they all enjoyed it too - lovely people. We played with lots of different silk fibres and Starburst Sprays - of course. I didn't realise it was going to be quite so warm today until someone mentioned it was 34 so at that point my feet felt tired and hot and I turned the air con on - as you would. Well I am really. Jacinta sent a big bag of wet soggy silk and wool today - she said it is raining and stormy in Melbourne and things don't take long in our garden. The wool is all dry and packaged and the silk is getting there. This is Wintergreen - a mix of both tussah and mulberry. Then I thought I would do a little more work on my piece - it has ended up on its side though. About to do lots of beading I think. And some hand stitching. All the Romeo has been washed out. Actually the studio is almost ready - we are going to work with loads of different silk fibres and rods and cocoons etc - hopefully it will be a good day - and of course adding lots of colour. I am not so good with pristine white. Nothing to do with the weather which is much better today but only suitable for trying on new red shoes to make sure they fit okay and are they comfortable so I cannot wait until it is cold enough to wear them. 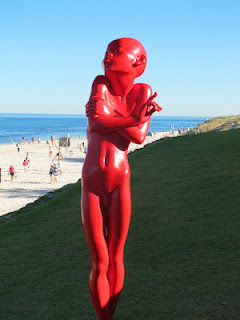 Floozina - they really are red - I am rather impartial to red shoes and for those people who ask - they are Arche and I have a few other pairs and they are so very comfortable and last forever. You can wear them all day. You just need to recover from the inital outlay of money. 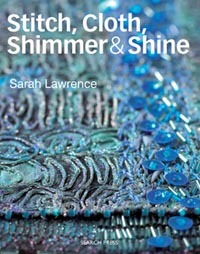 No - what really excited me today was Sarah Lawrence's latest and sadly last book which arrived today - true Sarah style and I can hear her talking as I looked through. 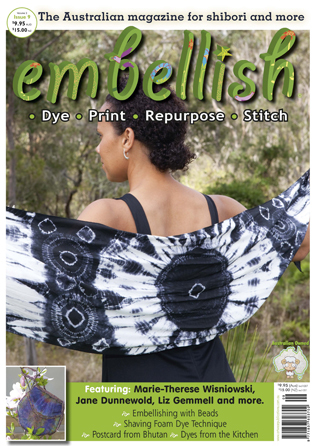 The Stampington magazines are proving to be very popular with Artjournaling selling straight away so I hav ordered another round with a few requests. new red shoes arrived today - certainly not for wearing just yet - have to wait until the weather becomes autumnal... I was going to get the black ones but the lady I spoke to told me to go for red - be a devil - just as well she didn't know about all my other red shoes. We also received a box full of assorted Stampington magazines which Ian has popped on the web - some have gone already. We are testing the waters on these and Stampington are being very obliging in sending a selection for us to choose. Little gripe for today - I hate it when I write an article for a magazine and don't get to see the final proof and then discover that there are errors when it is published. Things do need to make sense and read well. It isn't that I am perfect - far from it - but I don't like it. Thanks to Kaz and Bruce I had a lovely round of reflexology this morning - my feet are all fired up once again. Tonight we are off to Planet Books to use our book vouchers. 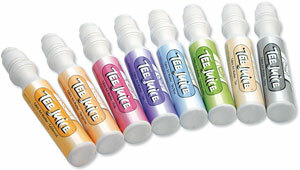 What did arrive were the new Tee Juice pens. There are now 16 colours and in in fine, medium and thick. I have been waiting for some time for these. We have even been able to reduce the price on the thick ones. The new 8 are pastel which makes a great contrast with the original 8. Have a look at the website to see them all. 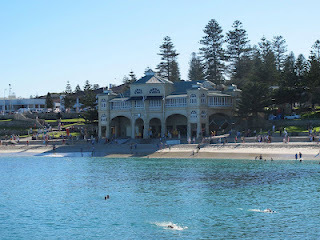 This is the Indiana Teahouse - Cottesloe is a popular beach - although driving to the beach in weather like we are having seems silly as you get hot again driving back home. 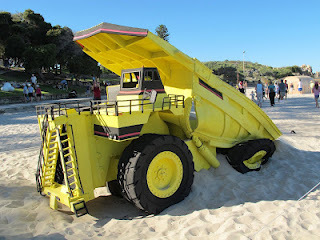 It is a very popular installation and loads of people go to see it. Found - my Paris Journal - thank goodness - I have been slowly roaming the studio looking for it all week and there it was sitting on top of a pile of stuff can you believe? Now it can go off on its travels on Monday. Wonderful win by the Hurricanes last night at our oval down the road. Not such a happy night at all for the Force. The weather is hot and staying that way so it will be indoors in air con this weekend. I have still not found my Paris book so a hunt is in order. I have been dreaming - or been slack - and the POMs - product of the month - have only just started to go - half were posted last night and the rest will be on Monday. my apologies - I would say the heat has fried my brain. When I have found my journal I shall start gathering everything for my Silk workshop on Saturday coming. There is a place left if anyone is interested. Making lots of silk paper in different forms. playing with various silk fibres, appyling colour, moulding and all of that. Hopefully it won't be too hot but my studio is air conditioned. Today is International Women's Day which should be significant but I wonder if it really is. Things don't change - Australia has a female prime minister but you do wonder if she really is her own person - the same f course could be said about any leader of course. The piece above is for Lynette - I have washed out my sampler and lain it on my precious piece of Ironbark Velvet so that you can see I have made no progress there whatsoever. Here I have ironed some TAP printed images onto Evolon and overlaid them with one of my Gelli prints on tissutex - those lovely clouded layers. I went to the dentist today for my annual visit and as hard as he worked, he couldn't find anything wrong so after the usual 'you could have implants and crowns and whatever' (every time) he had to admit all was well. I told him I had spent all my money on new specs and replacement lens for broken ones. Judy - the velvet for the Kimberley Dreaming piece - the flowers I embossed on with a stamp and some paint. Finally tonight - we are having a limited time special of Angelina fibres - a 100gram pot luck of all varieties and colours for almost half price - $40. I am tackling the area in the warehouse where Angelina lives and tidying it up so I made a heap of these bags today and they will be available at his excellent price until they have gone. The area is looking tidier already! Tonight Bruce and Kaz are taking us out for Ian's birthday to the Fat Dragon - very nice. We have had a long weekend - well the others have - it has been lovely and quiet so they must have gone away. Too hot to think though and I have been trying to work away on Romeo - this is some velvet I am stitching on but I am still of two minds. I have another lovely piece of velvet all ready to cut up and emboss and stuff - still drawing pics of what is in my head at present - yes I really do draw. I remember that Julia Caprara told me off when I said I didn't draw and pulled out some of my journals to show me my drawings. Funny isn't it - I had been doing all this drawing but hadn't thought it worthy to be called drawing. And then Jacinta sent me the first lot of Marrakesh in silk, wool and slushie - what do you think? and now Ian is hurrying me up to go off to eat. I had to cancel my Romeo workshop which was to run today but it is on instead on June 23rd but the upshot is that I have a tidy studio and time to develop a few more ideas. I decided to use the Gelli plate to create a monoprint on Romeo - I tried a few different things and was very pleased with how it went. I cut the top part out and laid it on a piece of fabric - which I had coloured with paint and shiva sticks and stitch the painted Romeo on it. Very pleased with the results. You could just paint on the surface but you do get a much better rise of paint this way and when you wash it out most of the paint stays. It doesn't have to be perfect. I have been quite a bit more romeo playing but this is just a little panel not yet washed out. We have had a good weekend of rugby watching - really enjoyed that the Chiefs and the Highlanders won and of course the Hurricanes. Had to get up early this morning to watch that one. Next week they are here to play the Force at our park. It's a long weekend in Western Australia this weekend so it is quiet. I could say they have all gone to Margaret River but I think it is more like Bali. Much cheaper. today - I feel a bit of a fraud because I am not a sketcher so much as a player as you will know if you follow this blog. But I guess so long as it leads to filling my journals and turning stuff into stitch and enjoying it all - that is the main thing. I have doing more prep for my Romeo workshop on Saturday but had better get moving because I still have a lot to do. More hearts though - big ones and small ones. Have been having fun making grid structures and wrapping sari ribbon. And I love it placed over another surface. Have I said before how much I love layers?